Chennai (PTI): The Tamil Nadu government today expressed concern over the “alarming increase” in number of “attacks” on Indian fishermen by the Sri Lankan Navy and sought the Centre’s intervention for release of 42 of them. Referring to a spate of “distressing” arrests of Indian fishermen from his state in the last few days, Chief Minister K Palaniswami said such apprehensions have a “demoralising impact” on fishermen as well as the people of the state. In a letter to Prime Minister Narendra Modi, he raised the issue of arrest of 14 fishermen in two separate instances by the Lankan navy on Saturday. 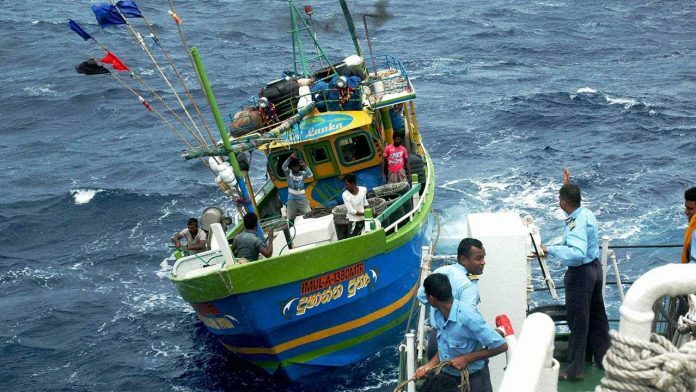 “In spite of the International Maritime Boundary Line (IMBL) between India and Sri Lanka being sub-judice due to the ceding of Katchatheevu islet, the Sri Lankan Navy is continuing its marauding attacks on and abductions of our fishermen,” he said. He recalled the state urging the Centre to use diplomatic measures to “prevail” upon Colombo “and reverse this trend”. “These instances, occurring on an everyday basis, in which our boats with innocent fishermen are being apprehended with impunity by the Sri Lankan Navy has a demoralising impact not just on the fishermen, but also on people of Tamil Nadu,” he said in the letter. The people of the state “strongly believe” that the fishermen have a genuine claim to the Palk Bay fishing grounds from where they “are being apprehended,” he added. the chief minister also pointed out that Sri Lanka has not released any of the fishing boats apprehended since January 2015, adding, that this “inhumane strategy” was causing great loss of livelihood to the fishermen. “There was wide expectation among the people of Tamil Nadu that the boats apprehended since 2015 would be released as an outcome of your meeting with the Sri Lankan prime minister in April,” Palaniswami said, referring to Modi’s meeting with Ranil Wickremesinghe in Delhi. “The alarming increase in the frequency of abductions by the Sri Lankan Navy is a matter of utmost concern for the (state) government and the people of Tamil Nadu. An immediate intervention at the highest level is sought to resolve this long standing livelihood issue of our fishermen,” he said. The Tamil Nadu government was taking “multifarious” steps to convert trawling boats to long liners and gill netters in the shortest possible period, Palaniswami said, adding all transitions take time. “The Sri Lankan policy of abduction of boats in this transition period without respite only indicates its increasing intolerant attitude and the scant respect for the Indian diplomatic efforts,” he said. The Chief Minister urged Modi to take the matter up with the highest authorities in the Sri Lankan government and ensure the immediate release of a total of 42 fishermen and 141 boats. 42 fishermen and 141 boats.